The Grafton Cornet Band is the oldest continuous band in southern Vermont with a proud tradition of serving audiences and musicians alike. 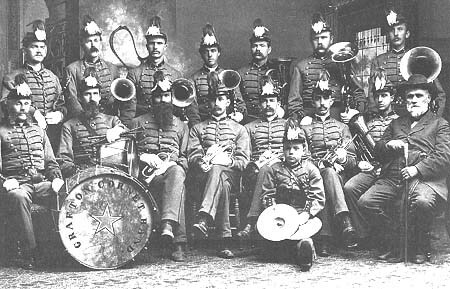 The Grafton Cornet Band was organized one hundred twenty-nine years ago in March, 1867 and the first meeting was held in the home of Vestus Wilbur in Grafton. That band is still going strong, giving the town of Grafton the distinction of having an organized Cornet Band in continuous service longer than any other similar organization in Vermont. The Band's membership and traditions have been handed down from generation to generation. The first Memorial Day was May 30, 1868. The Band played in the Grafton Memorial Day Parade then as it has every year since. In the picture above, Drum Major Francis Phelps is seen at right. He was for many years the proprietor of the hotel (now the Old Tavern at Grafton) and livery stable of the village. He was a rotund and pompous man, and very proud of the Band. Although not a musician himself, he made a very imposing appearance at the head of any procession. There was no combination of conveyance, driver and marshall, horses and band, better known throughout southeastern Vermont in those early days than the famous old bandwagon. Francis Phelps sat on the high-up seat and drove the four horses, the noted pair of "creamers" at the wheel, and then came the wagon itself filled with the Band members in brilliant uniforms and carrying their shining instruments. After Francis Phelps' death in 1888, Baxter Walker took over as drum major and the band bought him an extravagant $75 uniform now on display at the Grafton Historical Society. Band membership varied over the years. During World War I, players were scarce enough that the band had to hire critical musicians to fill out the parts. The lowest ebb was on December 18, 1936 at 3:00 a.m. when fire broke out at the village schoolhouse where band equipment was stored. The zero-degree weather made it impossible to save the building. Two bass drums, two snare drums, two tubas, two cornets, one baritone, one tenor, one trombone, two alto horns, plus all the band fixtures, chairs, music racks, music and stove were burned or melted beyond use. At a band meeting called in the blacksmith shop across from the ruined school, there was little enthusiasm. Suddenly, the silence was broken by John Grant, who said, "There will be Band in Grafton on Memorial Day if I have to take my horn and play up and down Main Street alone." The Band played on. The Band has played in every Wardsboro Fourth of July Street Fair and Parade since 1950 and every Hospital Fair Day at Grace Cottage Hospital in Townshend since its founding in the 1950's. Today, the band still has a bandwagon, driven and maintained by Bud Wilson since 1986. The uniforms here were in honor of 1991 Bicentennial of the State of Vermont and the naming of Grafton. As can be seen in the picture below, the band prefers comfortable street clothes for the 99 non-centennial years. The complete Grafton Cornet History can be purchased from the Historical Society.